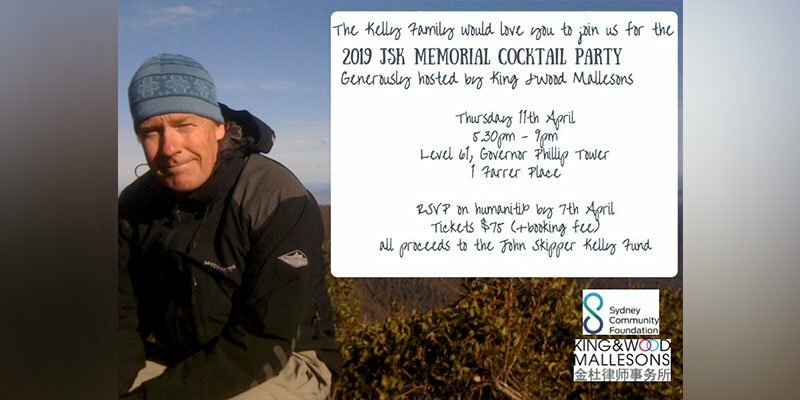 The Kelly family would love you to join us for the 2019 JSK Memorial Cocktail Party, generously hosted by King & Wood Mallesons. It will be a great chance to get together, raise a glass in memory of the late and great John Skipper Kelly, and raise funds for a cause that was dear to his heart. Entry is a $75 donation (+ booking fee). All funds raised will go directly to the John Skipper Kelly Fund – helping to create leadership and training opportunities for disadvantaged young people. Drinks and Food included.